Electronic Voice Phenomena EVP & Paranormal Investigations. - Chapter 1. Chapter 1 - Understanding sound. SOUND is an audible mechanical wave propagating through matter, or the perception of such waves by the brain. In other words your brain detects via the ear drum a sound and using it's memory banks decides for you what that sound is, as long as it has heard it before. The brain is also clever enough to tell you the approx distance of the sound and one very important and often forgotten ability, the direction the sound is coming from. An example would be; your walking down the street and you hear the sound of a coin hitting the floor. Without thinking your head moves down and towards where it heard the sound of the coin hitting the floor. If the coin has then rolled away in silence your left to scan the area and find the point it has hopefully moved too. The brain has done it's job by using the data received - the sound of the coin hitting the floor, but it can't do any more given the silence of the coin rolling away, it's left to you to scan and try to find it. If the brain doesn't have data it can't help you further. One peculiar aspect of hearing aids is, when fitted, you loose the ability for the brain to indicate the direction the sound you hear comes from. This is because sound travels through air and the ear receptors read this information and can no longer understand the sound source, the sound from the hearing aid just millimeters away. This brings with it dangers such as crossing the road, a car blows it's horn as you walk into the road but you don't have a clue which direction the horn sound is coming from. SOUND CAN TRAVEL THROUGH AIR, WATER and MATTER. Sound & Frequency: Frequency is the number of occurrences of a repeating event per unit of time It is also referred to as temporal frequency, which emphasises the contrast to spatial frequency and angular frequency. The period is the duration of time of one cycle in a repeating event, so the period is the reciprocal of the frequency. For example, if a newborn baby's heart beats at a frequency of 120 times a minute, its period – the interval between beats – is half a second (60 seconds (i.e., a minute) divided by 120 beats). Frequency is an important parameter used in science and engineering to specify the rate of oscillatory and vibratory phenomena, such as mechanical vibrations, audio (sound) signals, radio waves, and light. Now, all the above sounds very complicated and I have linked certain words (highlighted in orange) if you need to know more, but in very simple terms a single sound, for example a single bass drum beat, will contain certain frequencies as well as amounts (volume). It will also depend on the size of the drum as well as it's shape and the sound may well behave differently but the mechanics of the drum sound will be constant enough for frequency analysis. So a four piece band consisting of drums, bass guitar, lead guitar and vocals will all sound different, therefore if there is too much bass drum the Sound Engineer hears that, often with the help of a Spectrum analyzer and makes the required adjustments on his mixing desk, which could be volume, EQ or even both. REMEMBER - ANY recorded sound can be manipulated or edited. All recorded sound should not be trusted unless you have recorded it yourself and know it's genuine. SOUND SAMPLES - Understanding what has been recorded and the frequency spectrum. The art of recording any sound has it's problems let alone sitting in an empty room recording what you think is silence to find out later you have recorded a voice or sound. Certain sounds use certain frequencies. So let us now look at some samples of sound that have been recorded and view it in the form of a movie but with a spectrum analyser activated. This first sample is of three different breeds of dogs barking but not at the same time. 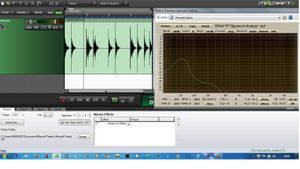 The dogs have been recorded and the sound sample placed into software called DAW (Digital Audio Workstation). Software types and costs, some are free, will be covered later in a different chapter. The screen shot below shows the track recorded (arrow pointed upwards) and the frequency analyser (arrow pointed right) Note explanation given. As the recorded sound is played the spectrum analyser activates and shows the frequency affected. You will now hear the dogs barking in a movie. Note the frequencies and the peaks of that frequency. Click on the square on the bottom right of the movie to make full screen. Press Esc on your keyboard to come out of full screen. In the next movie you will again see and hear a recording of a number of different wall clocks. Again note the frequency bands. Make notes of your findings if needed. On the clock sound samples from 0.19 seconds to 0.34 seconds you will see clear feathering of the sound spectrum which indicates vibration is occurring, other causes of this are echo, sound being projected back (a tunnel or cave reacts to sound this way) or a device that repeats sound, called 'delay' in music. The clock sounds before and after this time period shows distinct solid readings similar to the dogs barking sample. Take note of this type of feathering indication because it comes up very often in EVP readings when analysed. Effects such as reverb can increase the feathering effect, a recording in a large empty Church for example. If you recorded 100 feet away a singing voice your recording will sound hollow (reverb) but if you were to record 5 feet away the reverb effect would not be as obvious. With a voice, the natural vibrato differs from person to person. You have heard and seen (using a spectrum analyser) two different sound sources in the movie's above. Clearly each sound source uses different frequencies. There maybe some over lap but in general terms different sound objects can/will differ in exact frequency. 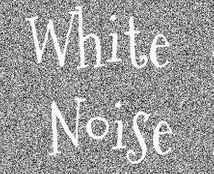 Before we look at other sound sources let us take a look at 'White Noise' - a term you would of heard of. Before we do that let me explain what 'White Light' is, this will help you understand the make-up of 'White Noise'. WHITE LIGHT & WHITE NOISE. WHITE LIGHT: White light is made up of all the colours of the spectrum in equal measures. There are many names given for white, for example; limestone, chalk, milk, sunlight etc. White light can become a different colour or shade of white if it becomes contaminated with other colours, you only have to look up to the sky to see that. 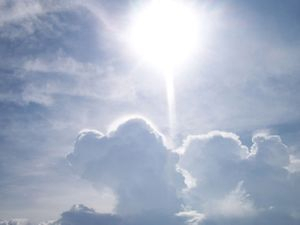 Scattering of sunlight in the atmosphere causes diffuse sky radiation, which is the reason for the blue colour of the sky and the yellow tone of the sun itself. White Noise works on the same principle of White Light. 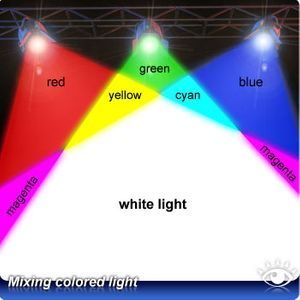 White Light contains all the colours of the spectrum. White Noise contains all the frequencies of the spectrum. reference to EVP is used. Both films suggest that 'White Noise' contains a visual stream of data and when viewed on a TV show the picture full of static dots which then manifests as a shape of a person whilst you hear static noise and voices. This is about as far away from the truth as is possible. Static is not EVP and EVP can only be viewed through a frequency spectrum analyser. So in the case of both films they have used white noise, white light and static and wrapped it up in the guise of EVP. White Noise is sound covering the full frequency spectrum. Here is an example what White Noise looks like through a spectrum analyser. I have a recorded a busy London street during the day. This sound sample can be called White Noise because it covers all of the sound frequency. The street will be full of noises from people talking and from different distances, cars, bus, lorries and traffic noise in general. Sound often reflects off buildings. So the recording device is not your ear and brain which can be selective of what it wants to hear. A perfect example of this would be: You attend a wedding and record the Brides Father's speech on your mobile phone. At the time you recorded all you hear is the Brides Father talking but when you play the recording back the following day you hear other people talking, staff walking about, glasses being knocked and maybe even traffic noise. A recording device is not selective it records everything. 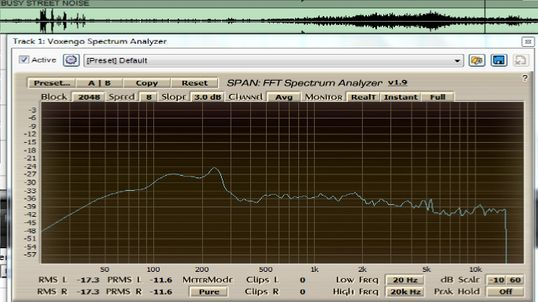 If you compare the above photo of the London street frequency spectrum recording to the photo to the left, which is a bass drum beat, you can clearly see the difference. If you recorded EVP of a bass drum beat you stand a very good chance of looking at a spectrum analyser and given you can also hear the drum beat, can accept that as a matter of fact what you have recorded sounds like a drum beat. So what about an EVP recording which covers all of the frequency spectrum?. Yes you can say without question you have recorded White Noise, but what have you recorded? What sounds are within this recording? I will mention again a point made on the Home Page. The use of the word VOICE is not a good description. It's not SOUND either because it's impossible to make out what is making each sound, it's NOISE. FURTHER STUDY: I have placed four additional sound file movies below to give you further examples of sound analyses. These are the issues your going to face with your own recordings. As you read through each Chapter the subject of sound will become clearer. Please go to Chapter 2 and we will look into the mechanics of EVP and consider a number of theories of who or what emits EVP.